Last year I did a German language course in Munich – it was really amazing! In my second week on the course, me and a few people I met whilst sightseeing went to the Theresienwiese, to see the tapping of the first barrel at Oktoberfest. It was unbelievable, with so many crazy people from all over the world. Over 6 million people, dancing, laughing, eating and DRINKING! I love the German beer and it’s so huge. They serve it in a jar (“Maß”), 1 litre per person. Amongst the many attractions, the beer is probably the most important thing. The food is also great though. I ate different Oxen specialties, real German Bratwurst with “Kartoffelsalat” (potato salad), massive Bavarian Pretzels and the Oktoberfest special of “Händl” (grilled chicken). 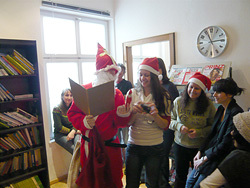 On Friday the German “Nikolaus” came to our school here in Munich. He looked a bit Santa Claus, but they told us that it‘s a completely different tradition. Anyway, it was fun!!! A few days ago, I came back from a German course in Munich, Germany. Before leaving for Munich I had already heard a lot of interesting things about the city and Bavaria: beer, sausages, dream-castles, and festivals… And it was true! My classes started at 2.30 pm, how wonderful! Being a bit tired from the long journey, I was happy to be able to sleep until 10 am. Finally I arrived at school at around 2 pm after a little sight-seeing tour through the city center, since the school is in the very heart of Munich. My short visit to Munich is rapidly coming to an end and so I reflect on my fortnights experiences in this big yet small city. 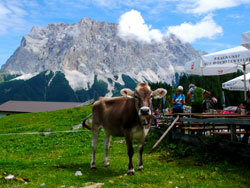 I did not have many expectations before I came… well except that I would probably eat sausages and drink beer! Of course it did not disappoint in this respect. I sampled many different beers and tried an assortment of sausages (and I fear my sausage count is close to 100 in a fortnight). The renowned Munich ‘weiss wurst’ with ‘suess senf’ is a must for any visitor. If possible, this first experience should be shared with a local so that they can demonstrate the eating ritual. Definitely worth a try! The famous “Oktoberfest“ is one of the most popular beer festivals all over the world with some six million people attending every year. Our teachers told us that we should attend the opening ceremony. The Oktoberfest staff and the breweries move through the city with splendidly decorated horses and coaches and traditional dresses. The area where the festival takes place is called the “Theresienwiese”, or “Wiesn” for short. What comes first into your mind when thinking about Germany? Good beer, sauerkraut, veal sausages and pretzels, dancing the Schuhplattler, traditional bavarian costumes… Of course that doesn’t apply for all of Germany but if you want to experience this culture and lifestyle then Munich is the best place for you! Furthermore, Munich is the most beautiful city in Germany I’ve ever been to. 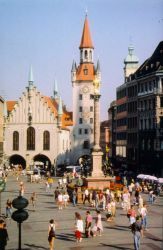 The best time to go to Munich is spring or summer. 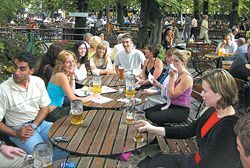 Then you can go to the English Garden and enjoy a cold beer or other refreshments in the beer garden near the China Tower or lie down on one of the huge green spaces on the waterfront of the Isar. It’s a really good place to picnic and to relax. Möchten Sie in Deutschland Deutsch lernen? Are you considering learning German in Germany? 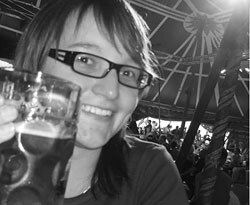 Whether you are a complete beginner or already very advanced, just listen to someone who has taken four language courses in Munich! I started learning German in middle school, and my parents encouraged me to go on a language courses during holidays. I was lucky enough to have family friends who lived in Munich, and invited me. 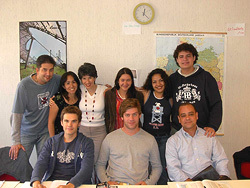 They recommended that I take a course in a local language school, and the result was I went back several times!